Gluten-free and dairy-free muffins loaded with apple pie flavor, topped off with loads of gooey vegan cheddar cheese. Preheat oven to 375F. Line a muffin pan with paper or silicon liners and set aside. Whisk all dry ingredients in a medium-sized bowl. Add dry ingredients to wet ingredients and mix until incorporated. Don’t mix too much or you’ll have rock-hard muffins. Fold in apple and cheese. 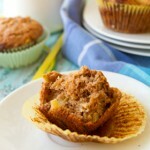 Drop batter into prepared muffin tins and bake for 22-25 minutes, or until toothpick inserted comes out clean. Allow muffins to sit in the pan for 1 minute before removing from the pan and placing on a cooling rack to cool. 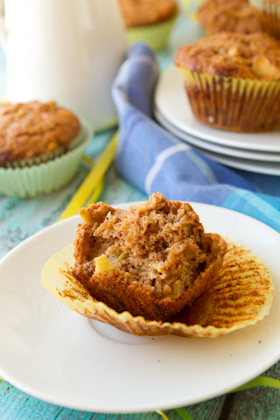 Store baked muffins in the fridge for up to a week, or freeze in an air-tight container for up to 3 months.